There were branch offices in cities around the country, including Dallas, which was the location of the company’s Southwestern offices, or, their “Gulf Department,” located in the American Exchange National Bank Bldg. on Main St. The warehouse pictured above was at 2014-16 North Lamar (in the West End warehouse district, between McKinney Ave. and Munger). Not only would merchandise being readied for processing be stored there, there would probably also be large fans going full-blast to dry out and remove the smell of smoke from items that would soon be sold for bargain prices, either to the public or to wholesalers via “fire sales” or public auctions. The company’s most famous fire sale (which they were quick to mention in later national advertising) was the huge dispersal of merchandise from the big fire at Neiman-Marcus in 1964. Instead of the usual, somewhat dull, inventories of shoes or boys’ coats or rope (“all sizes”), that sale included Neiman’s eye-poppingly expensive fur coats and other luxury goods (and, I think, every single piece of merchandise in the store that survived), all marked down to bargain basement prices. Now THAT is a fire sale. 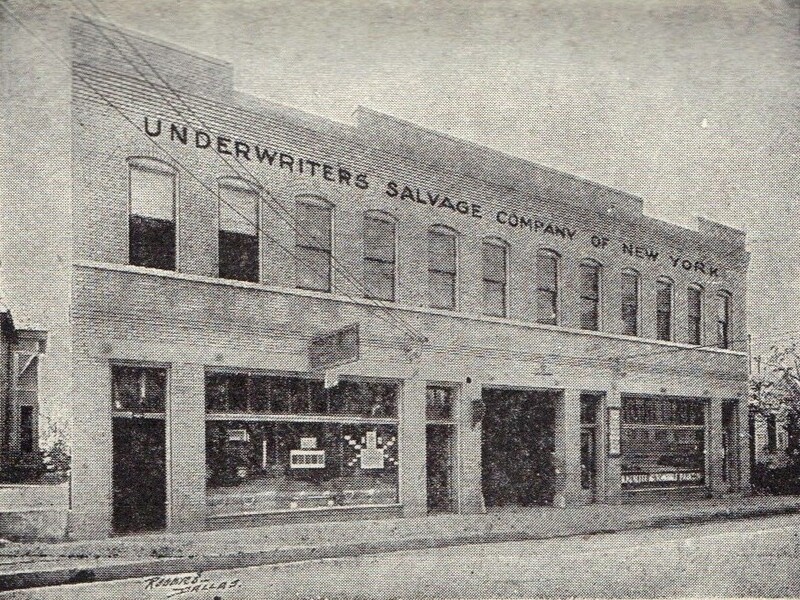 Top photo and text excerpt from a tiny pocket-sized booklet/calendar issued by the Underwriters Salvage Company of New York in 1920, featuring photos of the company’s branches around the United States. yes they were there for decades…….Dallas has always been a location for recycle, freight recycle and having too do with damaged goods, the Neimans fire of 1964, most items saved from the fire were cleaned and resold to such companies…..why not, whey waste……and then again everyone has a chance in life…..great story…..